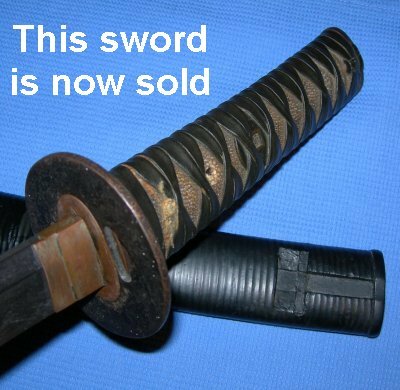 A Satsuma Rebellion sword with a mid-Muromachi (Koto) period Minho province blade signed by the first generation blade smith Kaneharu. A mid-15th Century blade by a recognized bladesmith, Kaneharu (see also Kaneharu / Sanmei for exact mei / signature match) in historical Meiji period Satsuma Rebellion mounts, complete with Chinese coins for menuki as was common. The 21 3/4 inch blade is in good order, though has a small nick to the blade. The hamon is barely visible but I am sure would yield something very respectable if given a polish. A very old blade in a historical setting. Further / full sized pictures available upon request. Item reference number 659 (261). Mei images further below (they are both of the same side of the tang; I just took a few as the signature is very old and hard to read / see). There is nothing on the other side of the tang.